The ARCTIC Close-Coupled Centrifugal Pump series are designed for continuous duty performance. 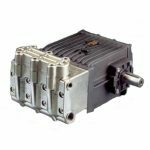 The pumps are manufactured in welded 304 stainless steel for reduced corrosion, and as a standard, are fitted with ceramic/carbon graphite/nitrile mechanical seals. They are single stage end suction centrifugal pumps close-coupled to NEMA standard motors with enclosed impellers for maximum efficiencies.